Are you ready to begin the process of making yourself a new etheric body and individuality? In the last century, Rudolf Steiner issued a challenge for practitioners of western spiritual science. Would it be possible to develop a new form of cognitive, or Michaelic, yoga? In contrast to the eastern yogis of old – who practiced the spiritualization of inhalation and exhalation – such contemporary yogic practice would involve a spiritualization of thinking as well as a transformation of perceptions and sensations. 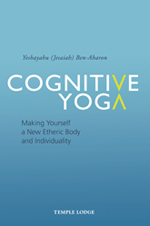 In Cognitive Yoga, Dr Ben-Aharon responds to that call, developing the entire modern yogic process and describing it in remarkable detail. Through the methods presented, committed practitioners of anthroposophy can create a living framework for spiritual research through a fully spiritualized thinking accompanied by a complete renewal of the experiences of perception and sensation as well as of the human body itself. Included in the contents of this extraordinary book is a comprehensive guide to the spiritualization of the senses and how this leads to a transmutation of the deepest and most unconscious bodily processes and functions. Cognitive Yoga culminates in a pioneering description of a completely individualized meeting with the etheric Christ in the etheric world – the most important spiritual and human experience that people can have in our time and over the millennia to come. This seminal work, built on decades of first-hand research, provides tangible evidence that western spiritual schooling is not only alive and well, but also full of potential for future development. Ben-Aharon offers a fully formulated and practical guide to a knowledge of the present revelations of the spiritual world. DR YESHAYAHU (JESAIAH) BEN-AHARON – spiritual scientist, philosopher and social activist – is founder of the anthroposophical community in Harduf, Israel, co-founder of the Global Network for Social Threefolding, director of Global Event College and contributor to the School of Spiritual Science. He is the author of The Spiritual Event of the Twentieth Century, The New Experience of the Supersensible, America’s Global Responsibility, The Event in Science, History, Philosophy & Art and Spiritual Science in the 21st Century.